Memory is the ability to remember and to recall previous sensations, ideas, experiences, or information that has been consciously learned. The Strange Case of H.M. It is hard to imagine what it would be like to live without memory. What if the things that people had just seen, learned, or heard simply passed out of their minds after just a few minutes? So many of the activities of daily life, such as reading a book, watching a movie, doing homework, holding a conversation, making friends, and going to the store, would be totally impossible. People, places, and events would always seem brand-new, even if they had been experienced before. Living without memory would mean always having to exist in the present moment with no awareness of the past. H.M. was cured, but with tragic results: He could no longer remember anything for more than a few minutes. He could remember events that happened more than 2 years before the operation, but new experiences or facts were quickly forgotten. In the more than 40 years that psychologists worked with H.M., his situation did not improve. He could remember a set of numbers or a new fact for a short while, but he would forget it as soon as he was distracted or new information was added. In fact, researchers had to reintroduce themselves every time they met with H.M., constantly reminding him where he was and why he was there. H.M. once said, "Every day is alone by itself," meaning that he could never make sense of today in terms of yesterday. He experienced time in separate chunks that were quickly erased from his mind. However, H.M. could still learn parts of new motor skills or routines and repeat them at a later time, even though he did not remember that he had learned them. For example, he gradually learned how to draw an image in a mirror, solve puzzles, and mount cigarette lighters on a cardboard display. H.M.'s remarkable case illustrates the fact that there are different types of memory that involve different parts of the brain. What Are the Main Types of Memory? Memory is generally divided into two broad categories: short-term and long-term. * epilepsy (EP-i-lep-see) is a disorder of the nervous system characterized by repeated seizures that temporarily affect a person's awareness, movements, or sensations. 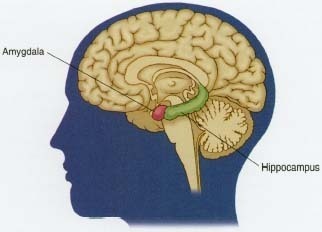 * hippocompi (HIP-o-KAM-pie)are two parts of the lower brain that together look like a small pair of ram's horns. * temporal (TEM-por-al) lobes are the side portions of the cortex. They contain the sensory center for hearing and are centers for language function. * cortex (KOR-teks) is the top outer layer of the brain. It controls the brain's higher functions, such as thinking, learning, and personality. Short-term memory is what a person uses for an activity such as remembering a new phone number after calling directory assistance. The person may repeat the number silently until dialing it, then promptly forget it. If distracted before dialing, the person may have to call directory assistance again. That is because short-term memory is fairly easily disrupted. Think about how students have to study new material in order to learn it, rather than just see it one time. Research has linked memory to the amygdala and to the hippocampus, two structures deep inside the brain. When surgeons removed the hippocampus from a patient known by the initials H.M., hoping to treat his epilepsy, they discovered that H.M.'s epilepsy improved but his short-term memory disappeared. H.M. could remember events that happened many years before, but not events of the previous day or the previous hour. H.M.'s doctors had to reintroduce themselves to him every single day. Basically, they are converting the information from unstable short-term memory into more stable long-term memory by attending to it and rehearsing it. People who experience severe head injury demonstrate how easily the process of short-term memory can be interrupted. For example, a car accident victim may not recall what happened just before impact or even during the accident itself. Some athletes who are knocked unconscious during an especially physical play may not remember what happened minutes before they were hit. This is because there was not enough time for experiences to be converted from short-term to long-term memory. Long-term memory, which is much more permanent and stable, can be further subdivided into two types: implicit and explicit. Implicit memory, or procedural memory, is the ability to repeat automatic tasks or procedures, such as riding a bike, driving a car, typing, or swinging a tennis racket. Of course, these tasks are not automatic at first; just ask any sixteen-year-old who is learning to drive. Over time, though, a person can perform the skill without giving it much thought. Explicit memory is recall for facts or events. This is what comes into play when taking a test, for example, or remembering someone's name. The patient known as H.M. lost the ability to turn new experiences into explicit memory but retained much of his procedural or implicit memory. Implicit memory appears to be controlled not by the hippocampus but by other parts of the brain. Thanks to H.M. and other patients who have had diseases affecting the hippocampus, scientists who study the brain now know that this structure and the nearby temporal lobes play a crucial role in turning what people hear, see, and experience into long-term memories. A Canadian neurosurgeon named Wilder Penfield also had a key part in identifying the importance of the temporal lobes in long-term memory. In the 1930s, while performing brain surgery on patients with epilepsy, Dr. Penfield used an electrical probe to stimulate different parts of the brain. Because the brain itself does not feel pain, the patients could remain awake during surgery. Dr. Penfield found that some patients experienced vivid events or scenes from their lives when he stimulated the temporal lobes. The memories were so vivid, in fact, that the patients thought they were actually reliving the experiences. Thus, 20 years before H.M. came on the scene, Dr. Penfield concluded that this part of the brain had a critical role in long-term memory. Today scientists know that other parts of the brain are important to the memory process as well. The thalamus (THAL-a-mus), a structure in the middle of the brain, relays incoming information from our senses to the cortex. These structures together with the hippocampus coordinate facts with their appropriate time and space context to ensure that an event is remembered as a unique happening. In other words, today's breakfast is remembered as distinct from other breakfasts in the past. What Else Affects Explicit Memory? A person's emotions affect the process of memory, too. Experiences that make people feel happiness, sadness, or some other strong emotion are more likely to be remembered. For example, most people over the age of 50 can remember exactly where they were and what they were doing when President John F. Kennedy was shot in 1963. Scientists believe that the function of the hippocampus is somehow linked to that of the nearby structures that are involved in controlling a person's emotional responses. Writing things down is an important part of the learning process for most people, whether it is to remember phone numbers and addresses, homework assignments, directions, or the teacher's lecture in class. But what if you had a memory so powerful that, when you encountered new information, you couldn't make yourself forget it? Such was the case with S., a man with a memory like a trap: whatever he came across, he could remember for life—and without writing down a thing. S.'s unusual ability was discovered during his days working as a newspaper reporter, when he never took any notes at news briefings. When his boss became concerned, S recited back to him the briefing, word for word. S went on to work with a psychologist intrigued by his ability, and also became a mnemonist, or a person who demonstrates his extraordinary memory to an audience. S. had a unique way of remembering that allowed him to experience information through several sensations, such as sound, touch, or taste. He envisioned numbers as forms, for example the number 6 as a man with a swollen foot, and the number 7 as a man with a mustache. Numbers also had textures and colors: the number 2 was a gray-white, and the number 8 a milky blue-green. These personal visualizations are what enabled him to absorb and store data with such extraordinary speed and permanence. After years of memorizing lists, tables, and other tests, S. could always recall anything he had ever learned. It seemed his ability was limitless. In fact S. tried to invent ways to forget what he learned. It seemed that S. did not really have a short term memory, so he did not experience the usual memory decay. Everything he learned was put into long term memory which is a relatively limitless and permanent storage capacity. Did S. even remember how to forget? Where do long-term memories go once formed, and how does a person retrieve them? Scientists believe that the entire cortex is involved in long-term memory, but exactly what happens to make or keep these memories is unclear. What is clear is that memories are not exact "videotapes" of an experience. Rather, memories are constructions that are filtered through a person's individual mental abilities and past experiences. Thus, two people seeing the same crime, for example, might remember the events somewhat differently. As a result, when people swear to tell the truth in court, it is only the truth that they have constructed from their memory, not literally "the whole truth and nothing but the truth." Neuroscientist Eric Kandel received the Nobel Prize for Medicine in 2000. His research showed that learning and memory affect organisms on a cellular level, permanently changing individual neurons. This may help explain why counseling and therapy, even without medication, can help people change mentally, emotionally, and even physically. Many researchers believe that short-term memories are the result of ongoing activity by brain cells, while long-term memories actually reflect structural changes in the brain. Basically, long-term memories are thought to be the formation of new connections from cell to cell in the cortex. Eric Kandel, who won the Nobel Prize in Physiology or Medicine in 2000, has found evidence to support this theory in what might seem like the strangest of places: the sea slug. Because the sea slug has a very simple nervous system, with large nerve cells distributed up and down its body, it is much easier to study than a human. If the slug is touched, it reacts in self-defense by withdrawing its gill. Dr. Kandel found that, if he repeatedly pricked the slug's head or tail for a few days, it would withdraw the gill more quickly and sharply. This heightened reaction would occur even when the slug was touched again at a later date. It was almost as if the slug remembered what had happened to it before and reacted accordingly. Dr. Kandel was able to show that there were actually chemical and structural changes in the synapses (SIN-ap-siz), or connections, between the nerve cells that sense touch and the nerve cells that control motion. More neurotransmitters (noor-o-TRANS-mit-erz), or message-carrying chemicals, were released between these nerve cells, and the connections between them were chemically strengthened. This is a very simple explanation of just one part of Dr. Kandel's research, but it is enough to show why this work is so important. Now that scientists understand how nerve cells communicate in sea slugs to form memories, they may be able to use this information to better understand how the human brain forms memories. Dowling, John E. Creating Mind: How the Brain Works. New York: W. W. Norton, 1998. Professor Dowling teaches a popular general education course on the brain at Harvard University. Greenfield, Susan A. The Human Brain: A Guided Tour. New York: Basic Books, 1997. Dr. Greenfield, a professor who lives in Oxford, England, is well-known for her ability to explain scientific concepts in ways that most people can understand. Kandel, Eric, and Larry Squire. Memory: From Mind to Molecules. New York: Scientific American Library, 2000. The authors are two of the scientists at the forefront of memory research. Their book explains some of the most important concepts of how memory works and what can go wrong. Exploratorium, The Museum of Science, Art, and Perception: Memory Exhibition. From 1998 to 1999, this famous museum in San Francisco, California, hosted an exhibition devoted to the subject of memory. An interactive web version includes games and activities that encourage users to test their memory and even improve it. Neuroscience for Kids. This website by a professor at the University of Washington features kid-friendly information about the brain and nervous system, including the functions of learning and memory.